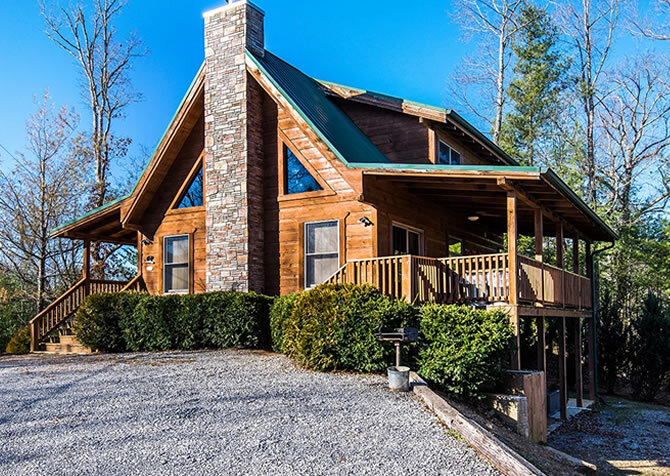 A welcoming front porch greets you at Around the Bend, a charming pet-friendly Pigeon Forge cabin that’s a little bit home, a little bit Smoky Mountain escape. As you step inside this 3-bedroom, 2-bathroom cabin for 10, you’ll find cozy spaces where you can relax, unwind, and enjoy the simple life — with all the convenient amenities you appreciate at home. 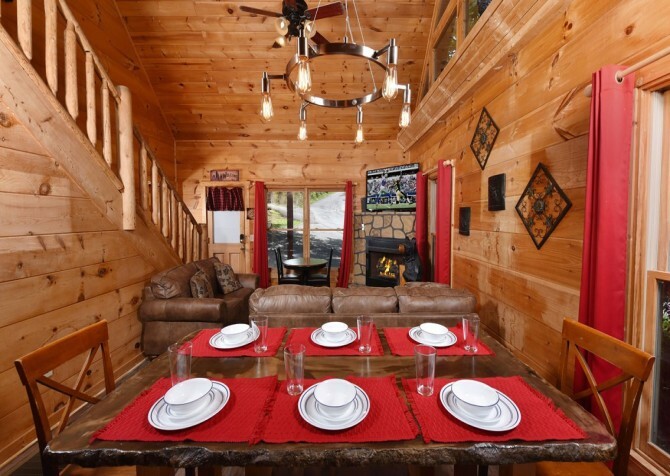 This mostly private cabin is also just 3 miles from the Parkway downtown. Here you'll find plenty to do, see, and eat, with some of the best restaurants, shopping, and attractions in the South! When the evening sun sets, head back to the cabin for air hockey and table tennis, followed by a movie marathon on the large wall-mounted smart TV in the living room. Concerned about missing your favorite part while refilling your popcorn? No worries! This open-concept home boasts a fully equipped kitchen within eyesight of the massive screen. And if it’s total relaxation you seek, venture outdoors for a soothing soak in the bubbly hot tub. At night, the cozy bedrooms are welcome places to rest after busy days exploring downtown and playing at the cabin. 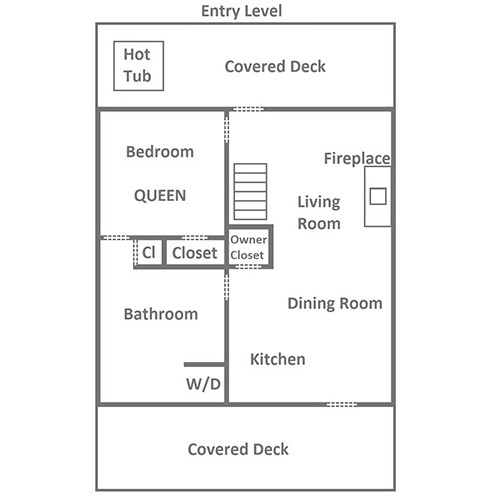 Across the 3 bedrooms, you’ll find 3 queen-size beds and 1 twin bed, along with 2 full bathrooms. Each even boasts its own premium wall-mounted smart TV for streaming your favorite shows anytime! Conveniences like TVs in the bedrooms, a washer and dryer, and high-speed wireless internet make stays even easier at Around the Bend! In the living room, kick back in a recliner with a good book or cozy up on the couch (doubles as a sleeper sofa) in front of the gas fireplace on cool mountain evenings. For movie nights or lazy days, flip on the large wall-mounted smart TV and relax. With tabletop lamps around the room, you’ll have perfect late-night reading light when you just want to chill as the little ones play around on the area rug in the center. And even more fun awaits at Around the Bend, with air hockey and a table tennis game! Just steps away, the fully equipped kitchen features what you need to create snacks, prepare homemade meals, or reheat leftovers (and store fudge) from the Parkway downtown — just 3 miles away! Brew a fresh pot of coffee in the mornings, brown bagels in the toaster, rinse fresh ingredients in the stainless-steel double sink, whip up family favorites on the stove, bake chewy chocolate-chip cookies in the oven, and toss the dishes in the dishwasher for easy cleanup when you’re done. Right off the kitchen is the dining area, boasting a large table for 6, great for family meals and board-game fun (provided at the cabin for YOU). And being so close to the living area, you’ll have plenty of space for other guests to join in on the festivities. In the mood for a little dancing? Clear the space, play your iTunes favorites, and have fun. Ah, nighttime at Around the Bend is cozy, comfy, and entertaining — with a ceiling fan plus a premium wall-mounted smart TV in all 3 bedrooms! The entry-level bedroom boasts a queen-size bed and a cushioned glider. 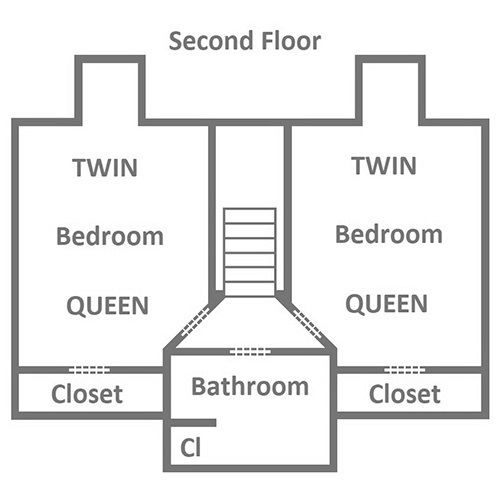 Upstairs, you’ll find 2 more bedrooms, each with a queen-size bed, a twin-size bed, and treetop views. 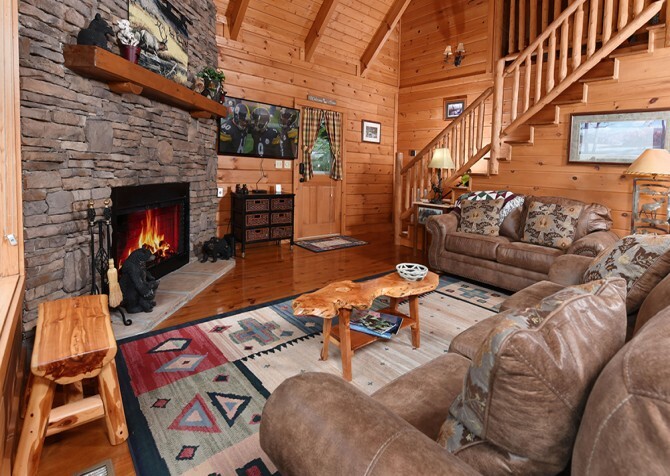 Add the sleeper sofa in the living room, and Around the Bend offers enough space for 10 guests, so you can bring the whole family or a group of friends for a memorable stay in the Smokies! Outside, unwind in the rocking chairs or climb into your soothing outdoor hot tub to relax muscles as you soak in the peaceful wooded views around you. And don’t forget to bring burgers, kabobs, and steaks to toss on the charcoal, picnic-style grill for cookouts! Bringing your bike? The gravel driveway is pretty flat, making it motorcycle friendly for parking, and the flat, paved roads to town make travel easy. Plus, there are no steps into the home, so unpacking and reloading the cars won’t be a hassle — bring on the souvenirs! What else does Around the Bend have to offer? Glad you asked! 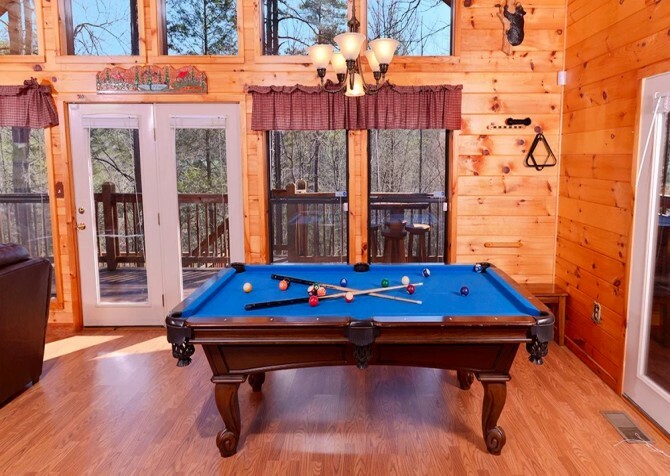 This Pigeon Forge cabin happily provides a washer and dryer so you can pack light as well as free high-speed wireless internet so you can post trip videos with ease. Best of all, this mountain home is pet friendly! Play tug-of-war, find new toys, explore new smells, and enjoy tail-wagging moments with your fur baby in the Great Smoky Mountains. It’s time to play, shop, and dine in Pigeon Forge! Only 3 miles from Parkway attractions, quaint stores, and top-notch eateries, Around the Bend keeps you close to all the downtown fun. With 3,00 feet of cable at soaring heights reaching 150 feet, zoom through the air at lightning speed across 11 lines at The Dome Ziplines. Challenge friends at the arcade, spray your kiddos on the blaster boats, and go-kart race to the finish line around 4 unique courses at The Track Smoky Mountains! Looking for a Southern feast with a mesmerizing show? Dolly Parton’s Stampede is where you’ll want to be, featuring horseback riding stunts, comedy geniuses, musical numbers, and a finger-licking meal.